The Favre Leuba Bivouac was the first mechanical wristwatch that could measure altitude and air pressure. 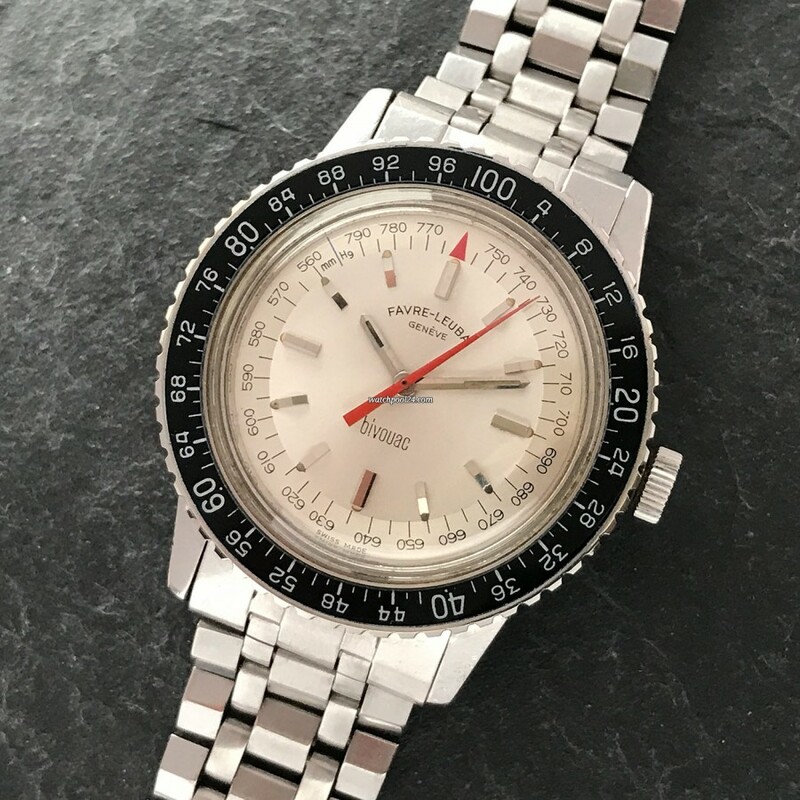 The watch offered here is the Reference 53203 from the late 1960s with a silver dial, black bakelite bezel and an original vintage stainless steel bracelet. Founded in the 18th century, Favre Leuba is one of the oldest watch companies in the world. The motto of the brand is "for those who conquer frontiers". The Bivouac is a barometer, altimeter and a timepiece at the same time. The silver inner bezel shows the air pressure in mmHg (millimeters of mercury). The black bezel shows the height above sea level up to 10000m. If the rotating bezel is in the starting position, the height above the sea (outer bezel) and the average air pressure at this height (inner bezel) are in line. If you know the current above sea level, you can read the average air pressure. If the red hand points to a lower value, the air pressure goes down, so the weather is getting worse, but if it points to a higher level, it will be sunny. This Favre Leuba scores with its super overall condition. The silver dial is free of scratches or other imperfections. The rotating bezel has a black bakelite insert that has been perfectly preserved. The bezel is very sharp and also proves that the watch was not polished and was rarely worn. The stainless steel case has minimal signs of wear and is unpolished. The reference number 53203 is engraved on the case back and is clearly legible. The Favre Leuba Bivouac is accompanied by a beautiful and rare vintage stainless steel bracelet. The clasp is signed with the Favre Leuba logo. The bracelet shows the same minimal wear as the watch itself. The Favre Leuba Bivouac can be regarded as a fascinating innovative work of art from the 1960s. The complications offered by this watch were an absolute masterpiece and a cornerstone for further development and research. Here you have the opportunity to buy a superbly preserved example of this revolutionary watch.